So, I recently had to publish a Xamarin.Forms.Android Application to Google Play. I experienced a few bumps along the way, but finally succeeded this very evening. First of all, you want to make sure that you disable debugging, specifiy an application icon, version the application and configure your linker. Afterwards, you’ll need to build the package in Release mode. No problem, right? Well, I personally experienced a “COMPILETODALVIK : UNEXPECTED TOP-LEVEL” error while doing so, which, apparently was related to Xamarin.Forms.Maps. If you experience this issue, it can either be due to missing permissions in your Android Manifest or the Heap Size. This is all explained in the previous forum discussion. After resolving the error, I was finally able to clean & rebuild the solution. Now, for signing the .APK, instead of using the command line tools, you can simply use the tools provided in Visual Studio. Simply navigate to “Tools” –> Android” –> “Publish Android App…” in the Visual Studio menu, and select “Create new keystore”. After you have created your keystore, select where you want your signed .apk to be built to and click “Publish”. Now, in your “bin/Release” folder, you will have two .apk files generated. So, here I was, thinking to myself, that I could simply upload the signed version of the .APK. But alas, when I tried to do so, I was told (no matter what I did) that the .APK was, to my amazement, not zipaligned correctly. I also did try to upload the aligned .APK which was generated from the publishing process, but to no avail. So, before I was able to publish, I needed to zipalign the signed version of the .APK. So, what I did was to grab a copy of the .APK which said “Signed” under “bin/Release”. I then navigated to where my Androd SDK was located, and jumped into “android-sdk\build-tools\<version>” and for ease, pasted my .APK here. Note: if you are unable to locate this folder, you probably havn’t insstalled the build tools. You can install the build tools in Visual Studio under the Android SDK Manager. Afterwards, I was finally able to upload my .APK to the Google Play Store. I finally figured out what was wrong with my references in my iOS project! Once I uninstalled OxyPlot.Xamarin.Forms, and installed the new 707-alpha PR, it was for “some reason” (actually a very good one, which you’ll see later) still referencing the Classic iOS OxyPlot.Xamarin.Forms API. I was frustrated by this fact, since, when I created a new project, this was not an issue at all. This got me thinking. I followed the steps, removed OxyPlot, re-installed the 707 OxyPlot.Xamarin.Forms PR from the NuGet Package Manager Console. Everyone who has ever developed an Android application is aware that the Android Emulator available in the Android SDK is currently awfully slow. You can boot up an emulator when you arrive at work, and later that month you will be lucky if the emulator has started (obviously exaggerated, but you get the point). To accomdate for the performance issue just mentioned, other tools such as Genymotion (paid) or the newly introduced Xamarin Android Player (free) can be utilised, where this guide will focus on the ladder. The problem is meanwhile, that none of the two will work if you use a virtual environment for development purposes, as they are virtual images themselves, running in VirtualBox by Oracle. 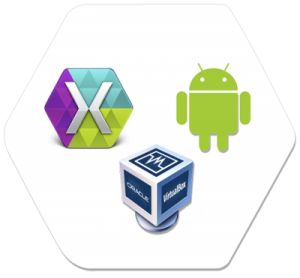 So, for that reason, this guide will explain how you can deploy your application, developed in any given IDE running on your Guest OS, to Xamarin Android Player running on a Host. To start with, several different actions are required to be performed on your Host OS which are explained in detail in the following sections. Having retrieved the IP from the Emulated Android Device, you can now move on to actually establish a connection between your Guest and Host OS to deploy applications to Xamarin Android Player. Note that, before procedding to the next section, you should wait untill your connection has been established anew, as the tunnel is essential for the next step. Since you have reached this section, your progress indicates that your internet connection has been re-established, and so has the connection to your the Host OS from the Guest. This means, that you by now should have the possibility to deploy applications written in your Guest OS to your Android Emulator running on your Host OS. Now, independently of which IDE you utilse, you should be able to choose the Emulated Android Device from Xamarin Android Player running on your Host OS as your Target Device in the IDE of your Guest OS.